I had a few minutes to talk to Susan about the challenges and importance of the document and about a training event she is hosting on December 3 about NFPA 652. Q: What was your biggest technical challenge with updating the NFPA 652? A: The biggest challenge for the committee with NFPA 652 was identifying those requirements that are fundamental to all facilities and processes where combustible dust hazards are possible. Q: How is NFPA 652 different from NFPA 654? A: NFPA 652 provides the fundamental requirements for all industries with combustible dust hazards. While NFPA 654 is more general than the other commodity-specific standards, its focus is directed towards the chemical processing industry. NFPA 652 now provides a baseline for all other industries, while, as a commodity-specific standard, NFPA 654 contains additional requirements that go beyond those in NFPA 652. Q: Why is training needed for combustible dust hazards? A: This training is needed to develop an understanding of the hazards of combustible dust. A leading cause of incidents involving combustible dust is a lack of awareness of the hazards. The new 652 standard contains the fundamental requirements for identifying and managing the hazards of combustible dust. It works with the existing commodity and industry specific standards to provide a comprehensive framework for managing hazards associated with combustible dust. Q: Who should attend this training? A: Anyone who owns or operates a facility where combustible dust is or could be present should attend this training. This includes facilities managers, EHS managers and operations personnel at these facilities. In addition, anyone who insurers a facility where combustible dust is or could be present should attend as well as authorities having jurisdiction (AHJ's) responsible for these facilities. Designers and consulting engineers, as well as installer/maintainers and manufacturers of explosion protection and suppression equipment should also attend. Q: What are the top 3 takeaways registered attendees will take from this training? What is 652 and how does it interact with the other commodity and industry-specific combustible dust standards. What is a Dust Hazards Analysis and when and how do I complete for my facility. 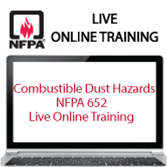 Susan will be hosting a live, online training event on December 3, 2015 from 11 am to 1 pm EDT on the subject of “Combustible Dust Hazards – NFPA 652” Click here for more information or to register.